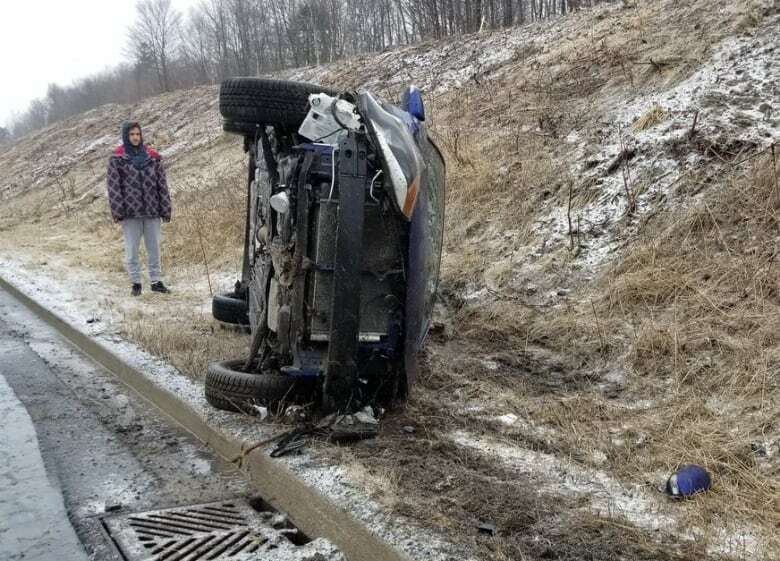 More than 550 crashes have been reported across and around the Greater Toronto Area as parts of Ontario deal with freezing rain, snow and ice pellets. 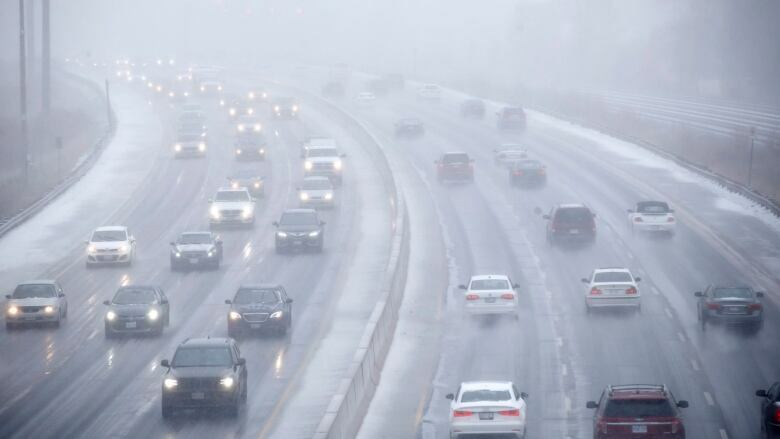 The mix of precipitation is coming ahead of a potential ice storm on Sunday. Many of the GTA crashes are single-vehicle collisions, with cars ending up sideways, going into ditches and concrete walls, spinning out and going the wrong way, according to Sgt. Kerry Schmidt of the Ontario Provincial Police's Highway Safety Division. Schmidt urged drivers to stay off the roads if possible. "We have problems all over the place," Schmidt said in Mississauga. "Don't drive if you don't have to. It's windy, it's wet, it's cold, it's miserable. All of that altogether, and we got crashes all across the GTA." Just before 9 p.m. ET, Schmidt tweeted that the OPP was currently responding to about 50 road collisions. The City of Toronto said Saturday afternoon nearly 80 salting trucks are on the roads to help clear snow and ice. Toronto's Pearson International Airport said more than 210 arriving flights and over 220 departing flights were cancelled. Some colleges and universities also cancelled classes and exams. Toronto remained under a freezing rain warning, with Environment Canada saying an ice storm is "likely on Sunday." Colette Kennedy, meteorologist for CBC News, said a slow-moving low pressure system, plus gusty northeasterly winds, is bringing the wintry blast of weather. Snow has been reported north and west of Toronto. "We can expect a mix of all types of precipitation coming through the GTA and much of southern Ontario, frankly," Kennedy said. "It's changing every minute." 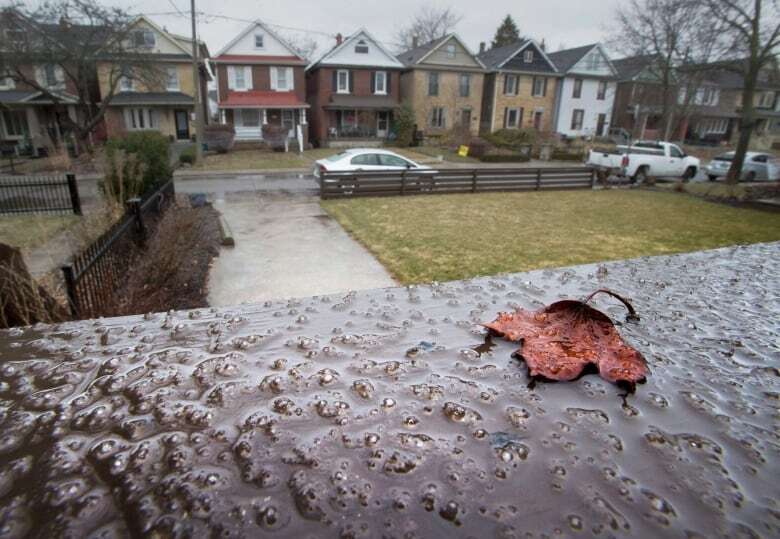 On Saturday afternoon, the freezing rain and ice pellets were expected to turn into "all ice pellets" before ice would start to build up later in the evening. 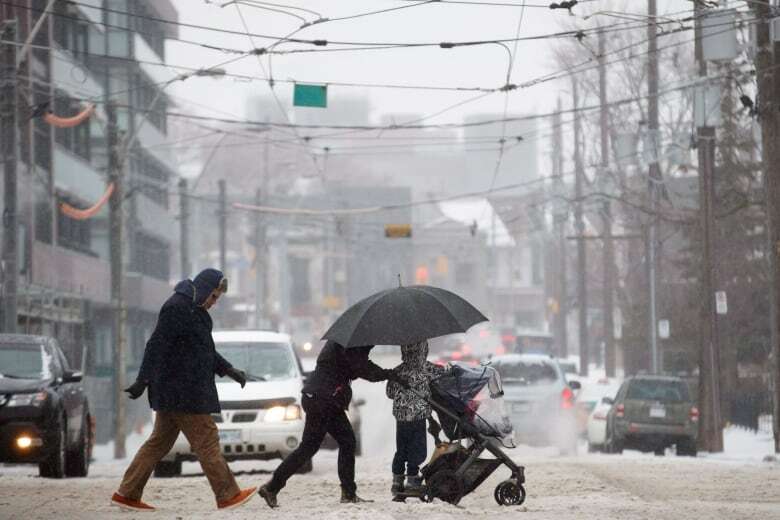 The freezing rain was expected to last into Sunday, Environment Canada said, and the weather could lead to significant buildup of ice and power outages. Ice buildup of 10 to 20 millimetres was likely in Toronto by late Sunday, the weather agency added. Increasing the likelihood of power outages were winds that were expected to gust between 70 and 80 km/h an hour, and the possibility of ice-laden trees falling on power lines. Roads, if not treated with salt, could be "dangerous," especially if the ice causes tree branches to fall on roadways, Environment Canada said in its warning. 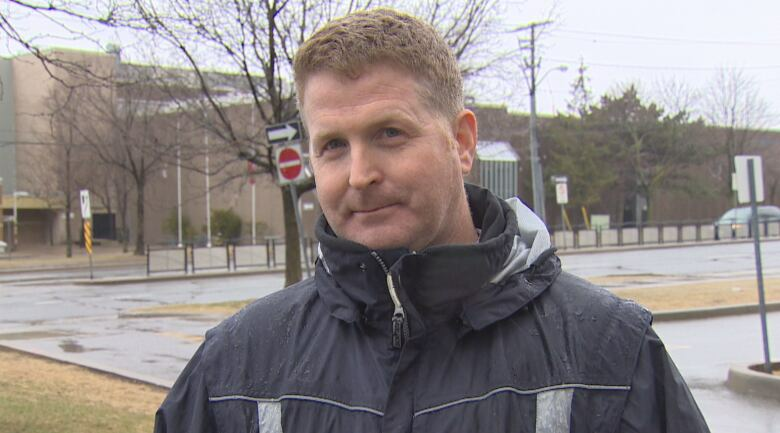 For residents to stay safe during the storm, James Kilgour, the director of Toronto's office of emergency management, is asking residents to stay informed, check on their neighbours and to stay away from downed trees. ​"Your safety is paramount. Do not approach that," Kilgour said about fallen trees. "Call 311, 311 will then be able to triage it and put the appropriate parties there to attend to that situation." Tori Gass, spokesperson for Toronto Hydro, called the storm an "all-hands-on-deck situation" involving 30 extra crews — three times the number on a normal Saturday. She said Toronto Hydro was prepared for possible outages, but there may be delays to get power restored if the weather gets particularly dangerous. Jay Armitage, spokesperson for Hydro One, which provides power across Ontario, said it received three times the average number of calls on Saturday due to the storm. Hydro One said it has crews ready to respond to outages round the clock, and additional resources are on standby this weekend. By Saturday evening, more than 6,000 people were without power. Alectra Utilities reported earlier in the day that more than 15,000 customers lost power in St. Catharines, but by the evening, it had been restored to all but 1,400. "Significant" rain could fall late Sunday, which could lead to flooding on roadways and low-lying areas Sunday night into Monday. 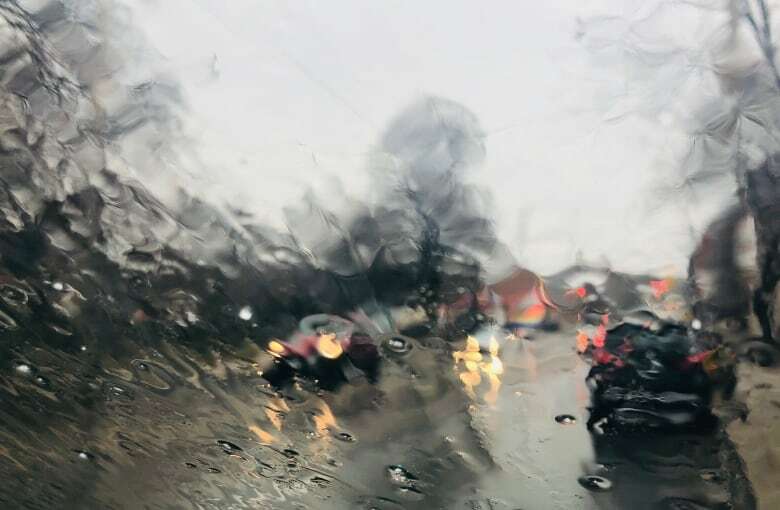 According to the Toronto and Region Conservation Authority (TRCA), five to 10 millimetres of rain fell Friday night in the GTA, bringing the total rain fall over the past three days to 15 to 25 millimetres. The TRCA said it is difficult to anticipate the amount of flooding, but advised the public to stay alert to changing weather conditions. The spring storm is due to a moisture-laden low pressure area over the central U.S. that is moving toward the Great Lakes this weekend. As the low-pressure system approaches, the northeasterly winds are expected to bring cold arctic air, forcing temperatures below freezing on Saturday morning. Winds may also affect bodies of water, including Lake Ontario and rivers, and all shorelines, rivers and streams in the GTA should be considered hazardous, it said. York University, Humber College, University of Guelph-Humber and Ryerson University all cancelled exams Saturday and will reschedule them. York University said in a statement: "Due to the higher than acceptable possibility of slips and falls due to road and walkway conditions that are likely to materialize through the course of this morning, the university is enacting weather emergency procedures and suspending normal university operations today, effective immediately." Humber College also cancelled an open house, classes and all events. University of Guelph-Humber rescheduled exams for April 20. At Sheridan College, classes were cancelled, while libraries, food services and recreational facilities were closed. Centennial College closed its campuses and cancelled classes. At Ryerson, morning exams for noon were to proceed as scheduled, while afternoon exams were cancelled. University of Toronto, Scarborough campus, closed at 3 p.m. ET on Saturday and was scheduled to reopen on Sunday at 9 a.m., weather permitting. Maple Leaf Sports and Entertainment, meanwhile, closed Maple Leaf Square, outside the Air Canada Centre in Toronto, out of public safety concerns, hours before the start of the first NBA playoff game between the Toronto Raptors and Washington Wizards. Pearson urged travellers to check flight status before leaving for the airport. If flight status has not changed, travellers should leave early to allow additional time at check-in, the airport said. More than 250 flights were cancelled by Saturday evening. Robin Smith, spokesperson for the Greater Toronto Airports Authority, said earlier that the authority is monitoring the weather closely. "Our de-icing team is fully staffed and prepared to process aircraft for departures, while our terminal staffing has been increased to provide additional customer service staff for passengers," he said in an email. North of Toronto, the town of Newmarket said it closed all of facilities, including its public library, as of 2 p.m.